Story: The gypsies had kidnapped a baby, which they offered Dracula in return for camping on his grounds without suffering under his savagery. The child having RH-negative blood, was unfit for consummation but instead of disposing the child somewhere, he adopted the girl, naming her Dracurella . 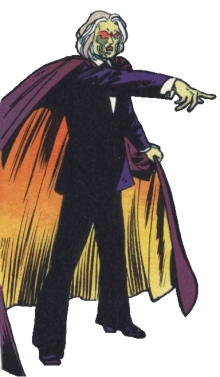 Skills & abilities: Dracula has the powers of a vampire i.e. enhanced strength, speed, shape changing and immortality from being undead. Background notes: This is one of the strangest versions of Bram Stoker's famous Count. For the most part it is downright silly, like he way he likes city-dwellers because they have carbon dioxide in their blood (i.e. a blood soda), but otherwise it is surreal like him being married to the evil queen from Disney's Snow White and having Victor von Frankenstein in his employment. Dracula: Bram Stoker's original story.